EPPA can withstand massive strains during feed production (pelletization) and storage such as high temperatures, pressure, shear forces or oxidation impact. It is also compatible with most antibiotics and can be generally used in feeds alone or in combination with an antimicrobial programme. The basic innovation of EPPA involves biotransformation of natural elements embedded in a matrix of microorganisms into bioactive compounds which improve health and productivity of poultry 4 birds. EPPA combines cutting edge biotechnology and classical veterinary science, based on a holistic approach of minimizing disease and boosting nutrition utilisation. EPPA is also designed to minimize the need for antibiotic use and maximize their effectiveness when needed. The novel strain of Bacillus subtilis (ATCC: 12711) available in EPPA produces bacteriocin subtilin, which is effective against wide range of pathogens. Besides antimicrobial compounds, they also produce other metabolites which vary in their spectra of activity. The probiotics in EPPA are also known for their ability to degrade proteins extra-cellularly, he availability of enzymes also allows the bird to obtain higher digestibility of the nutrients in feed. The high concentration of prebiotics and probiotics in PPA stimulates the non-specific immune response in bird thereby activating all immune defenses. Use of PPA also reinforces the response to vaccination and ‘eatment. The betaglucans in EPPA have high affinity and high idsorption capacity to bind the most important naturally occurring mycotoxins and reduce their ill effects. Due to volatility in raw material prices, farmers are now searching for innovative formulations that help birds to perform with less digestible feed ingredients. Use of EPPA helps increase this flexibility in formulating cheaper diets without negative impact on performance. The novel and relevant combination of Xylanase, Amylase, Cellulase, Protease and Phytase, in EPPA help release extra energy from less digestible substrates. 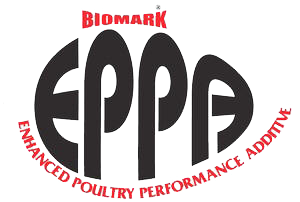 As higher levels of cheaper alternative raw material are added to poultry diets, the use of EPPA offers the means of reducing the problem of gut viscosity which is usually linked to the significant amount of non-starch polysacccharides (NSP). Specific enzymes in EPPA combined with optimum dosage help to improve the quality of the feed. The poultry industry world over and particularly in India is passing through a phase of uncertainty with cost components reaching critical limits. Inclusion of EPPA helps in ensuring higher net profit per bird and overcoming the scenario of higher chick price, higher feed price, high cost of labour and higher cost of veterinary service and medicine. 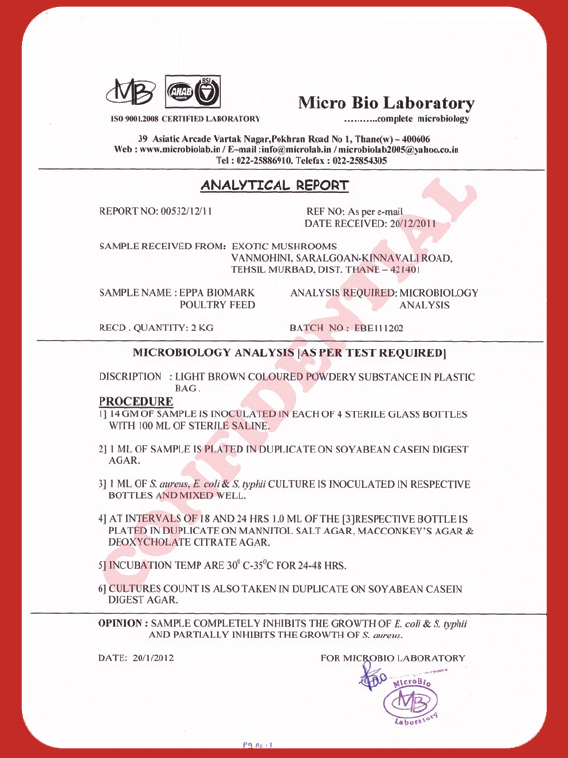 The in vitro studies on strain of B. subtilis were conducted to verify the antibacterial activity against zoonotic strains of E. coli, Salmonella and Staphylococcus. The antimicrobial substances of proteinaceous nature produced by B. subtilis have shown maximum zone of inhibition against selected pathogens. A few of these pathogens are also associated with infectious causes of wet litter in layer poultry. EPPA controls this infections, checks loose droppings and is instrumental in raising overall standards of hygiene. 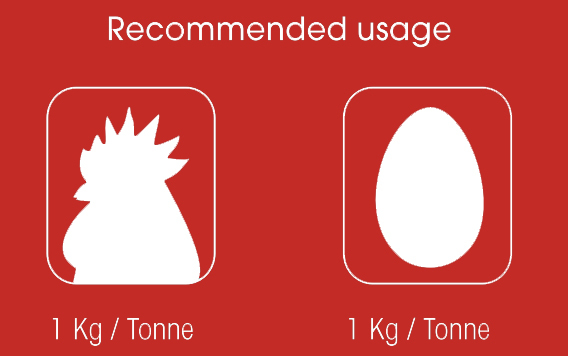 The supplementation with EPPA offers a sustainable solution and also a highly effective means of raising healthy, productive poultry while safeguarding animal health. and makes our products safe for bird, man and environment.